Whoever and whomever are both pronouns. Choosing which one to use in a sentence, however, has been a challenge for many English speakers and writers. You could’ve sworn these two are always interchangeable. My boss will hire whoever is nice to him. The coach will kick out whoever skips basic training. You can also use whoever as a subject complement. Whoever you are, I like you already. Whoever it was did not leave any fingerprint. Whoever he was appeared lonely. Still can’t tell which one to use? 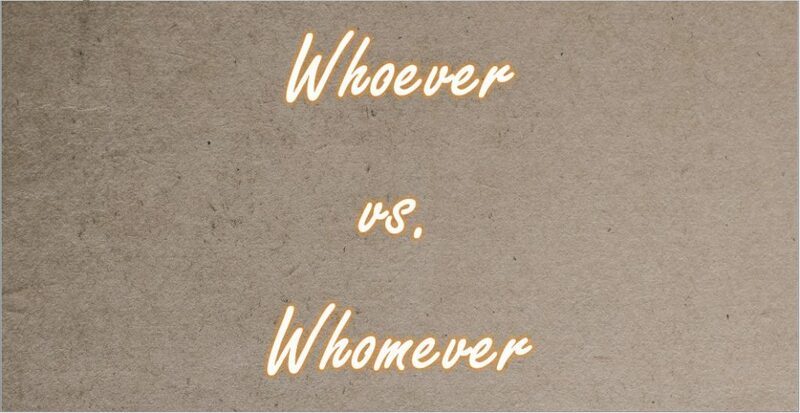 Just remove whoever/whomever altogether. Rewrite your sentences so you won’t need either. Give this memo to whoever/whomever at the legal department downstairs. Give this memo to somebody at the legal department downstairs. Whoever/whomever eat my donuts, you’re in big trouble. The one who eats my donuts is in big trouble. Anyway, if grammar is not your strong point and you have more than just whoever/whomever to think about, just get some help. We’re talking about using the online grammar and spelling checker. It’s free and easy to use so you really don’t have any excuse for not using it.